Shwe-Dagon is the most important pagoda and pilgrimage site in Myanmar. The structure dates from about 600 AD. In this near view, the main zedi (pagoda) is covered in a scaffolding of bamboo. The structure was put up to enable the regilding of the zedi with gold leaf, an operation that routinely happens to this day. The trees in the foreground are today replaced with a wide forecourt dotted with smaller zedi and shrines. 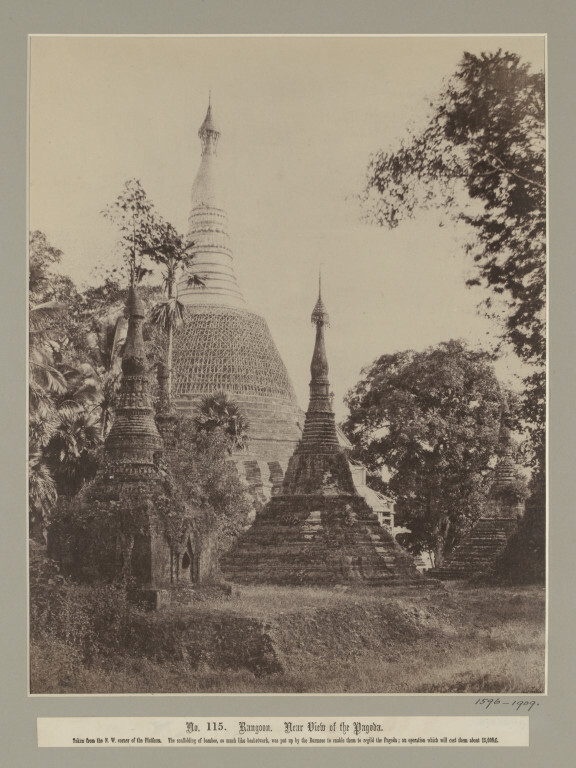 Linneaus Tripe created one of earliest photographic records of Burma (Myanmar). His reputation as a photographer developed in India where he was employed in the East India Company army. Appointed to accompany the first British diplomatic mission to Burma in 1855, he was instructed to record information about the country. Tripe took over 100 images, demonstrating his skill in observation and composition. He used calotypes or paper negatives, which gave the prints a ‘soft-focus’ look. This image shows one large zedi (pagoda) with several smaller ones nearby. The main zedi is covered in a scaffolding of bamboo. There are trees surrounding the structures. 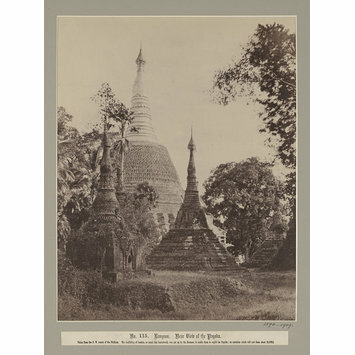 This photograph was one of a series from 'Burma Views' which was presented to the V&A in July 1909 by Lady Ida Low, wife of Malcolm Low, Esq., of the Bengal Civil Service and daughter-in-law of General Sri John Low. As a member of the Council of India in 1857, Sir John Low received the Burma Views (1857) set on 15th April 1857. See Registry files for papers on acceptance of gift. See Dewan p.255 for listings of other copies of the same photograph elsewhere. Dewan, Janet. The Photographs of Linnaeus Tripe: A Catalogue Raisonné. Toronto: Art Gallery of Ontario, 2003, p.307.